A new print, created by Carly Wormmeester, provides a powerful image of the importance of our recognition of Indigenous Sovereignty in Michigan and the Settler Colonial reality of taking over land that belonged to the Anishinaabe. Carly’s print is based on one of our articles under the heading of Indigenous Resistance, an article entitled, More White Lies: Grand Rapids and Settler Colonialism. 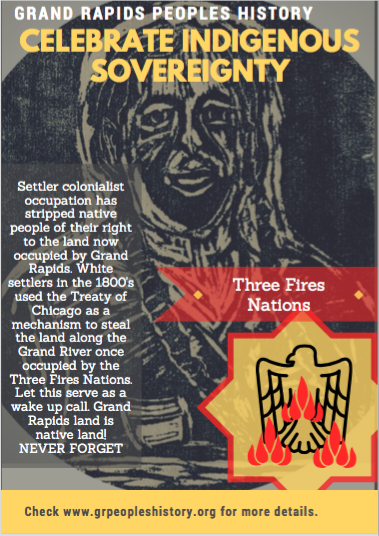 The print provides just enough information that exposes the lies of Settler Colonialism in West Michigan and celebrates the Three Fires Tribes. This entry was posted in Indigenous Resistance, People's History Artwork and tagged Indigenous Sovereignty in Michigan, settler colonialism in Grand Rapids, theft of indigenous land in West MI. Bookmark the permalink.